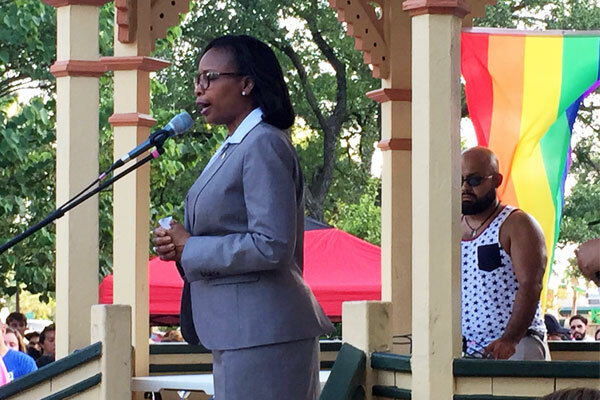 San Antonio Mayor Ivy R. Taylor was jeered by about a dozen protestors while she gave the opening prayer at a June 16 vigil in Crockett Park for the victims of the Orlando shootings. 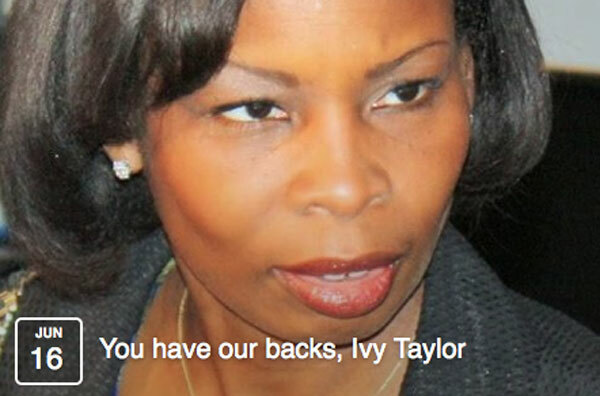 The screams of “Shame on you Ivy” and “You’re part of the hurt Ivy” as well as other insults drowned out the mayor’s prayer during what was an otherwise peaceful and moving vigil commemorating those who died in Orlando. Protest signs went up and the shouting began as soon as the mayor began to speak. It continued through her entire presentation. A peaceful protest had been previously announced where several individuals said they were going to turn their backs on the mayor while she spoke. Those who jeered her were not part of that group and their shouts overshadowed the original intent of the other planned protest. A couple of people tried to engage the protestors and arguments ensued, all of which added to the noise level which made the mayor’s comments difficult to hear. Mayor Taylor arrives at vigil for Orlando victims. The mayor’s prayer was thoughtful and compassionate even if it did not specifically mention the LGBT community. I am here with you to pray as we mark the loss of so many innocent people. I believe in the amazing power of prayer and that we are one San Antonio, a city that rejects the hate and heinous acts in Orlando. So I ask that you would please bow with me in prayer. 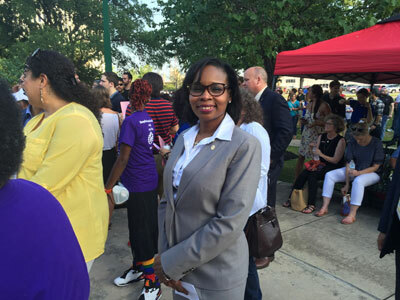 Once the mayor finished the prayer, she was whisked out of the event by her security detail. The rest of the vigil went smoothly with speakers representing communities from throughout San Antonio. Faith leaders who spoke include Father David Garcia, pastor of Mission Concepcion; Rabbi Mara Nathan of Temple Beth-El; and Rev. Elder Ken Martin of MCC San Antonio. 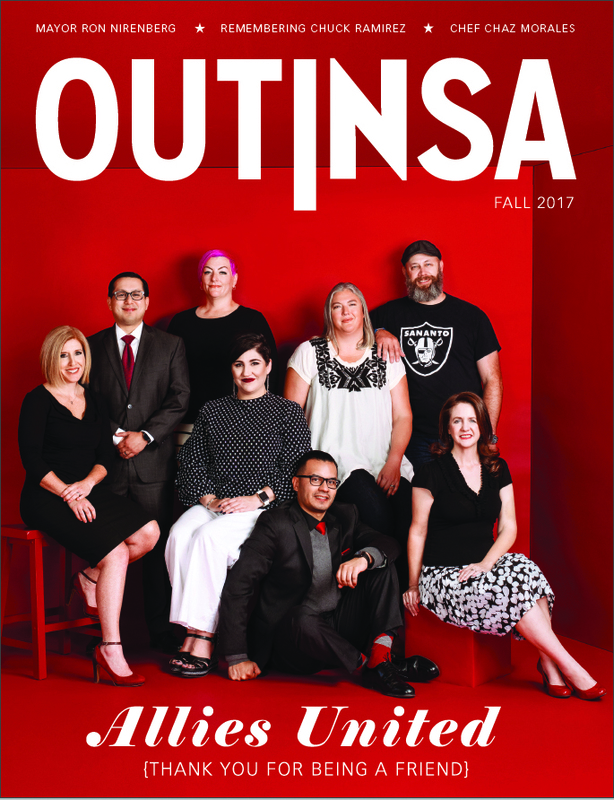 Some of the community organizations that participated were the Sakib Shaikh Muslim Children’s Education & Community Center, Dignity San Antonio, the Raindrop Turkish House and the National Diversity Council. There was also music, reflections and a reading of the names of the 49 who died at the Pulse dance club on the night of the tragedy. 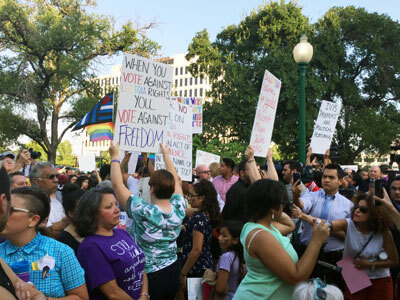 An estimated 750 people attended the vigil which was organized by Pride Center San Antonio. 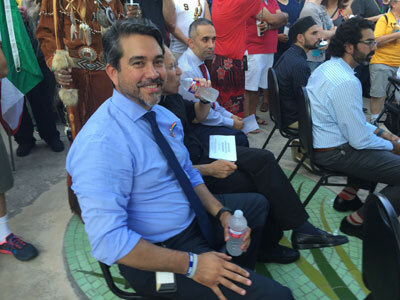 District 1 City Councilman Roberto Carlos Trevino.